WORLD PREMIERE of IN DICE WE TRUST Written and directed by Lamont Stephens. Get free screening passes to the world premiere for In Dice We Trust! The show has yet to be picked up by any network. Be one of the first to see it before everyone else. The after-party is sold out. As two late teen's -- a recently paroled hustler trying to get out of poverty and a privileged wannabe gangster trying to get in -- connect, they learn how much they need each other, and that the line between legal and illegal isn't always well-defined. 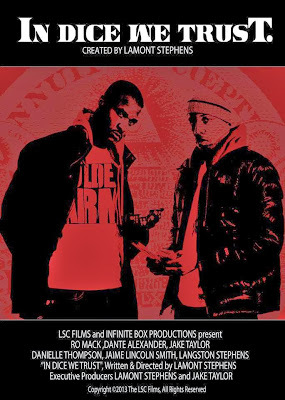 Written and directed by Lamont Stephens, IN DICE WE TRUST is an urban drama about two young men from opposite sides of the track who make their names from their involvement in an underground gambling ring. Ro Mack, Dante Alexander, Jake Taylor, Danielle Thompson, Jaime Lincoln Smith, Lydiana Medellin, Renae Torrance, Samantha Ivers, Rob Morgan, Shalimar Zahra, La Rivers, Topper Cheatham and Terrell Wheeler.